The small white building on Port Haney Wharf has a long and mobile history. It was built by George Shewfelt in about 1935 as a real estate and insurance office. It was located on 8th Avenue [224th Street] near St. Anne’s Street. A building of this size – measuring only 10 x 13’ – was long considered quite portable. It was moved onto the Port Haney Wharf the first time as the office for Beckstrom’s Towing in the 1950’s and features prominently in pictures taken of Princess Margaret’s visit by float plane in 1958. Still later, the little building was moved off the wharf to an adjacent area where it became the Wharfinger’s office. 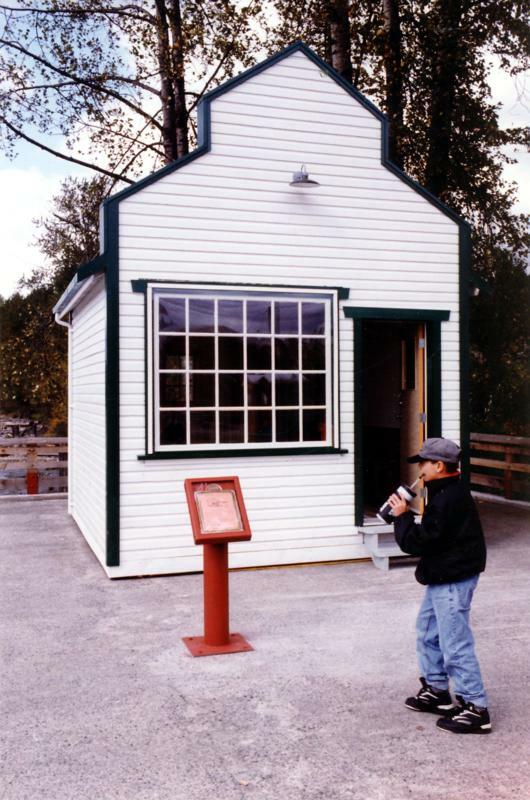 It eventually went out of use and was in danger of destruction when rescued by volunteers from the Maple Ridge Historical Society who moved it to the museum grounds for a period of restoration and then back to the wharf for the opening of the Heritage River Walk in 1992. The building can be rented from the Historical Society for wharf-centred events or for filming projects. Contact us for further information.